Yesterday was Memorial Day here in the United States. It came at a good time. I’ve been keeping so very busy that I’ve been able to stay ahead of the sadness, the heaviness. Yesterday, it caught up with me. Mike, Annabel and I drive by the Los Angeles National Cemetery all the time. I have always wanted to go pay my respects to those who fought for my country, and I knew Memorial Day would be a good day. It is is amazingly peaceful at the cemetery, especially when you realize it is completely surrounded by noise – a freeway on one side, city on the other sides. I sat on the grass several times, and tried to breathe while I thought about my Madeline. Growing up, TV and movies taught me that cemeteries are scary places to be feared. Not this cemetery. I listened to birds chirp and the wind blow, and the calm helped me when I was overcome with sadness. The rows and rows of resting places left me awestruck. My great uncle was a POW during World War II. He was in a camp in Germany for many years. When I see a POW flag, I think of him. I’d never been to a cemetery and thought, “this is some one’s child” until yesterday. And even though the majority of the men and women buried there bravely fought wars, at one point in their lives they were little babies that their parents cradled to in their arms. On the day we remembered and honored veterans, I also remembered my Madeline, and wished desperately that she was walking with me, holding my hand. .-= In Due Time´s last blog ..First Piece of Art =-. How beautiful Heather. I wish your Maddie was there holding your hand too. I know she was with you while you walked, but I know that the sadness must be so intense and devastating for you. You are an amazing mother. You inspire me every single day. You are in our thoughts and prayers every day. I hope that the peace you felt at the cemetary may carry with you a little in the days ahead. I don’t think I can say it better than Tricia already did. I, too, am inspired by you all the time, in your glory, in your sorrow, in your beautiful way of being yourself… I wish with all my heart she were holding your hand, but I take solace that you are holding her tight in your heart, and I too hope for more peaceful, happy moments spent thinking of Maddie. For you, for Mike & your family – for all of us. I wish that Maddie was with you, too. This post is such a beautiful tribute to those who are laid to rest there….and to all of those whom Memorial Day is dedicated to. … You wrote that you were growing up and ‘learned’ that cemeteries are scary places and it reminds me of how I used to feel. I have always had a deep respect for places where people are laid to rest, but I used to be so upset by and creeped out by cemeteries that I had a real phobia about ever being buried. I thought of different alternatives…. anyway, before my husband and I moved to Germany, we were on one of our visits with his parents here and we went to his grandparents’ resting places. I was immediately struck by the difference between these cemeteries and what I knew from the US. Here almost every grave is made entirely into a little garden, if you will – the entire grave is planted with seasonal flowers, some have pretty shrubs too, and decorated…lots of trees around. It is amazing to see. It completely changed how I feel about cemeteries. Sorry for sidetracking. I do wish Maddie had been there to hold your hand. Thinking of you guys. (((Hugs))). Crying and wishing so badly she was too!!! !I But, I do think she was there is spirit but, I know that brings little solace when the place you want her the most is in your arms……and so do I Sweetie. Yesterday, I stopped and remember Maddie as well. She fought a different kind of war with her breathing and weight issues but like a brace soldier, she never complained….did what she HAD to do, and did it. Forever remembering her….forever mourning her loss and most of all, forever loving her and the family who, like all of those soliders, the family who love and miss her so very much!!!! xoxo! .-= AmazingGreis´s last blog ..I’m not a Princess, this ain’t a fairy tale… =-. I agree with Tricia; I wish Maddie could have been there with the three of you. .-= Lynn from For Love or Funny´s last blog ..I need 30 pairs of shoes because I have 60 feet =-. Since I have become a Mom I too think “This is someone’s baby”. I think it when I see an accident, go to a hospital, a funeral. I think it at weddings and happy times too. Mostly I remind myself of that whenever grown-ups are rude, mean or ridiculously bitchy. I remind myself that this is someone’s baby, be nice to them their Mother would appreciate it even though their ‘kids’ are acting like brats! It helps keep me calm and maintain my niceness! .-= charlane´s last blog ..BBQ Cake =-. Beautiful post! (((Hugs))) from here, as always. .-= jen´s last blog ..bunches =-. Beautiful post and a great way to pay your respects. It has only occurred to me in the last few years that cemeteries really are serene places. The quiet is different and peaceful. I find that I could spend a lot of time there visiting loved ones. .-= Jenny´s last blog ..Lost and Found =-. When I was a kid there was an old cemetary near my house – we would all ride our bikes there and look at the stones together. I thought it was kind of cool to look at the old stones. It wasn’t until I lost my Grandmother when I was in high school when I realized that each one of those graves were someone’s grandmother, mother, father, grandfather, sister, brother, or child. I thought of all the sadness there and now when I visit my own father I have a whole new respect for them. I often read the stones walking through his row and I can almost name all the people by heart. I imagine what they were like. I love when I see fresh flowers knowing someone has been there to visit them, it gives me some sort of peace. What a wonderful way to spend Memorial Day, I wish Maddie was walking with you too. I’m sorry to hear the sadness in your voice. I’m sure Maddies wishes she was walking with you too. .-= java´s last blog ..Strawberry Salad with Poppy Seed Dressing!! =-. .-= Deborah´s last blog ..And Now For Something Completely Different =-. Beautiful pictures. The small flags by the headstones always tear me up. Having my husband overseas makes Memorial Day difficult in our house. I wrote a post yesterday about what it means to our little military family, and it is so wonderful to read a post about another family that is NOT military recognizing the day for what it truly is instead of just BBQ and sunbathing. Thank you for taking the time to honor our veterans. I am sorry little Maddie could not be there with you. .-= Lora´s last blog ..Little Oak Tree =-. The pictures and descriptions are amazing! What a wonderful way to honor the brave men and women who defended our country. I dreamed last night that Maddie got to met Annabel. How we all wish that was a reality! Wishing she was still with you, too. Sending lots of hugs and love to your family. This post brought me to tears. I wish she was there with you too. Wow, those pictures are breathtaking. The words tear inducing. Through my tears and with my broken heart I send you love. I wish Maddie had been there with you too. .-= Lisa´s last blog ..Making Memories =-. How odd that I’ve often thought that very same thing: all these tombs here are somebody’s baby. .-= Alexandra´s last blog ..I Haz A Button? =-. What a great post! I also wish that your little maddeline was here with you all, but I am sure she was not too far Beautiful pictures, thanks for sharing! .-= Nicole´s last blog ..My Brother, My Best Friend =-. That was a great thing you all did, yesterday! Thanks for sharing. Cemeteries are no longer scary once the physical remains of someone you love is buried there. It becomes a place of peace and beauty. .-= Kim´s last blog ..From Tragedy to Transformation – A Mother’s Story =-. I look forward to reading you every morning. I often want to post so you know how much I admire your writing and the beautiful spirit you bring forth. If you lived in my neighborhood we would be great friends. Much love to you and your beautiful family. Great way to remember what the day is truly all about! I wish Maddie was there too, oh, how I wish!!! Heather, That was so beautifully written! God bless you and yoru family! Both your daughters should have been holding your hands. I am so sorry. So few people honor what Memorial Day is really all about. Thank you for sharing this. Beautiful post! Love the picture of your husband and Annie! I, too, wanted to go to the National Cemetery here in Mpls. yesterday, but I would have felt weird going alone, so I didn’t. Thank you for honoring all those lost! Yesterday we found a cemetery in the country. Alex and Scout cleaned, I took photos to upload. We didn’t get through the entire thing because it started to rain. There was one small marker for a boy about 3 years old. The inscription from his parents was, “Darling we miss you.” Which summed it all up. The weight of the sorrow we carry, both for ourselves and for others, is a testament to the love we’ve had. I like to believe that that love continues. .-= Amanda´s last blog ..Maybe it will =-. Beautiful post. I wish your Maddie were with you. Thank you for the pictures, as well. My paternal grandfather, who I never met, is there (died as a U.S. Army veteran). .-= Mary´s last blog ..Hands-On Quilting =-. Those pics were great Heather. I’m sure that your Maddie is with you every day and every second. We never forget our mamas and no matter where we go we will always come back home. Oh, how I wish she could have been there with you too. All those soldiers and men and women who died for our country are so brave—and so are you. My uncle is buried in that very cemetery. I’ve always found cemeteries to be calming. Sad, yes. But calming. .-= Issa´s last blog ..For the BlogHer newbies – Part one =-. This was a beautiful tribute both to her and to our military’s fallen heros. .-= Mary´s last blog ..Blessed =-. I come from a long line of veterans from WW2 on down. It makes me proud that other people make a conscious effort to remember the fallen. Thank you, from the bottom of my heart. PS…If you felt the wind at your back, I am sure Madeline was with you. I wish so bad that she was there with you also. But … im sure in a way she was there. She is always there with you! Seeing that photo with Mike cradling Annabel in his arms makes me teary eyed. I wish Maddie was walking there with you too. really?! I didn’t put that there. What a very weird and unnerving coincidence. It SHOULD be an ad for a phone company. Your words brought tears to my eyes. So beautiful. .-= Jenny @ http://motherlawyercrazywoman.blogspot.com/´s last blog ..Falling From Grace =-. You are just amazing people, it’s no wonder you have a legion of fans who love your family. Of course you can count me as one. What a nice way to spend Memorial Day. I’ve always found cemeteries to be very peaceful, even as a kid I felt that way. I was never creeped out by them. My aunt was my daycare provider when I was little, and two of her sons had passed away in childhood, and both were buried at our local cemetery. She would visit their graves every now and then and I’d go with. She always called it “a resting place” and so the image I got was that of people resting peacfully after their life on earth was over. Those pictures are beautiful. Thanks so much for sharing. .-= Katrina´s last blog ..The Strike =-. One of the most amazing things about you, Heather, is that in the midst of your own grief you are still thinking about others. Five years ago we lost a close friend to the war in Iraq. My husband just retired from active duty yesterday, and it’s a loss that will haunt him forever. I was so angry yesterday when I logged on to Facebook and saw entities like Nabisco, Kraft, and SATC2 wishing “Happy Memorial Day!” and promoting their products. Memorial Day is not a happy holiday. I’m not saying everyone should sit around wearing black all day, but just take a moment to reflect on those who made the ultimate sacrifice so we can have our freedoms and three-day weekends. Thank you for using your voice to remind people of how significant Memorial Day is. I’m so sorry Maddie wasn’t there to learn from you. You are an awesome example of compassion. .-= Noelle´s last blog ..I Remember =-. It means a LOT to me as a military wife (and a mother as well) to know that IF (GOD FORBID) my husband should die in battle, someone other than just myself and our son would remember him. I am so thankful for people like you and your family. Your compassion is so moving. Thank you for sharing this with us!! .-= Kate´s last blog ..ON THE FIELD!! =-. I visited the American cemetery at Normandy once and looking at these pictures I remembered the military precision of the rows of graves. Reading the comments I feel very sad that I didn’t think about our war dead on Memorial Day. I will try to do better next year. I’m not sure how to write this comment, and I truly hope it comes out as sincere as I wish. I came upon your blog the day Maddie passed. My world, forever, was changed on the day. Yes, I had thought about death but in a very distant way. For some reason, Maddie and you touched me in a way that I am unsure of. I love her and miss her even though I never got to officially meet her. Yes, my point. Let me get to that. I guess what I am trying to say, is that your family made me appreciate life so much more. I am forever changed b/c of Maddie. I no longer take the little things for granted. I too think about the fact that he/she was someone’s baby at one time and mourn for that parent whenever I hear about someone passing. 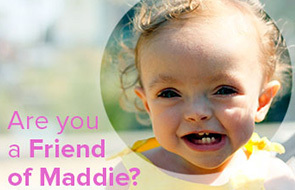 Thank you for sharing Maddie with us and letting us love her. .-= Jenn´s last blog ..F&%K CANCER =-.